A few blocks from downtown, in a dirt parking lot across from a metal warehouse, stands the tallest building in Sandpoint: an old grain elevator. The surrounding lot used to be the granary distribution center for the region, but for newcomers passing by it looks abandoned, or at least no longer relevant. Locals know better. Inside the building is a rock-climbing gym. In the warehouse across the lot, next to an art gallery, is Evans Brothers Coffee Roasters, where pictures of skiers and snowboarders hang on the wall and a dog, Roxy, greets customers at the espresso bar. Most people here know each other, especially during weekdays, when there are no tourists who come for Lake Pend Oreille, or who stop by on the way back from Schweitzer Mountain Resort. This area, the Granary Arts District, is one of Mayor Shelby Rognstad's favorite places to go. It has all the charm of a small town, it shows the character of Sandpoint's artistic community and it's become a hub for community events. Its transformation into a haven for small businesses and community building says something about the city's character, Rognstad says: "It kind of speaks to Sandpoint's grit and nature, to make the most out of the resources we have available with creativity and ingenuity." Yet people outside the Inland Northwest have a different picture of Sandpoint, one possibly belying that of the typical small city of its kind. It's the birthplace of Sarah Palin. It's the retirement destination for Mark Fuhrman, the former Los Angeles police officer convicted of perjury for lying about using racial slurs as a witness in the O.J. Simpson criminal trial. It's roughly 35 miles north of the former Aryan Nations headquarters, the white supremacist group founded by Richard Butler. All of that has created a perception of Sandpoint that many locals reject. Rather, Rognstad calls Sandpoint a blue dot in the middle of one of the country's reddest states. Understanding this may offer a more informed perspective on the latest reason Sandpoint has been in the news. 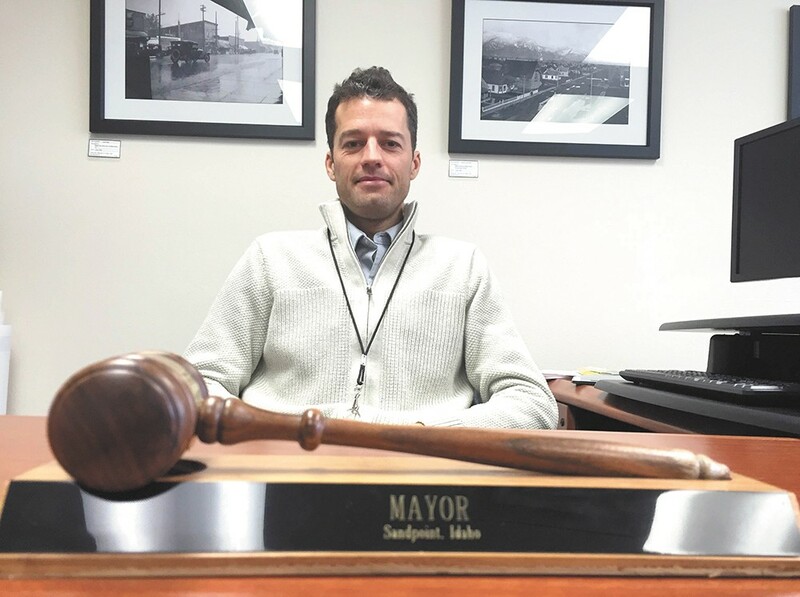 Rognstad, in his first city council meeting as mayor on Jan. 6, introduced a resolution stating that Sandpoint welcomes refugees. The resolution came after Idaho Gov. Butch Otter asked President Obama to halt the resettlement of refugees in the U.S., and after Bonner County commissioners and the Bonner County sheriff came out in support of Otter's request. So when word got around the county that Sandpoint might welcome Syrian refugees — even though Sandpoint has no actual authority to place them in the city — things got heated, creating another situation that locals hope will not come to define the community. Rognstad moved to Sandpoint in the late '90s for the same reasons most people move to Sandpoint — the beauty of Lake Pend Oreille, the nearby wilderness, the abundance of outdoor activities and the small-town lifestyle. He founded a bookstore and café before it closed last year, and he co-founded the Hive, a local music venue, in 2013. Now he's involved in real estate. Sandpoint residents will often talk about how diverse the city is, but they don't mean racial diversity. In a town of 7,760 people, 95 percent of residents are white, according to the U.S. Census Bureau. What they mean is diversity of thought, culture and economic status. An art gallery can be seen on seemingly every street corner in Sandpoint. There's a strong music scene for a town of its size, and events and tourist attractions bring in people from all over the region. Residents bristle whenever Sandpoint and North Idaho are brought up as former havens for white supremacists like Butler, the man who set up Aryan Nations headquarters in Hayden before losing a civil lawsuit that broke up the group in the early 2000s. Laurie Huston, owner of Northwest Handmade in downtown Sandpoint, says she's never really experienced racist attitudes in her 20 years living there. She says it's a small town where everyone greets each other on the sidewalks and where kids are safe. "There's always been this label on North Idaho, and I've never really experienced that label. I've never really been around that kind of conversation, even," Huston says. "But I could see it's been lingering." Yet it's hard to argue there is not still an element of bigotry after the mayoral election last year. Sandpoint residents received a series of automated calls, one of which called Rognstad a "feminized male" whose zoning plan is proven to draw in "undesirable elements from the outside that turns towns into crime-ridden trash heaps." It went on to call the people of Ferguson, Missouri, a "violent jungle of looters and primitive destroyers." His opponent, Mose Dunkel, denied any involvement in the robocall, and Rognstad believes him. At the time, Rognstad told the Inlander that whoever was responsible for the message represents only a small vocal group. "I want to be careful not to pigeonhole Sandpoint as this hub of racism and bigotry," he said. On Jan. 6, hundreds of people packed into Sandpoint's council chambers. About a hundred more waited outside in anticipation of a proposed resolution affirming the Sandpoint City Council's commitment to human rights and nondiscrimination. But first, outgoing mayor Carrie Logan had to formally hand the reins to Rognstad. Before she did, she made a proclamation stating the importance for nondiscrimination "in light of recent events." "Terror is caused by people of varied ethnic, religious and political backgrounds. Thoughts of Nazi Germany, Japanese internment camps, McCarthyism, xenophobia and the Ku Klux Klan come to mind," Logan said. "Although well-intentioned, discussion of banning groups of people due to their religion is counter to the Constitution and the historical practices of this country." Later during the meeting, the new mayor introduced the refugee resolution, which echoed the language in Logan's proclamation. A little more than 40 people signed up to speak in support, while nearly 100 signed up to speak in opposition. A majority of those who signed up were not residents of Sandpoint. Rognstad expected to see a certain amount of public participation, but this dwarfed anything he'd seen before. "It took some effort to maintain order in there, for sure," he says. After a lengthy public comment period, the city council voted to table the resolution until the Jan. 20 meeting, at which point Rognstad withdrew it. He said it only served to divide the community, and pointed out that the city had already passed a similar human dignity resolution in 2001. The reaction went beyond a high turnout at the council meeting, Rognstad says. Last month, he got his first death threat. People across the nation called him and asked for the resolution to be withdrawn. Logan hoped that the council would have passed the resolution anyway. "I was really disappointed in the council," she says. "I thought they caved." The Bonner County Human Rights Task Force was created in the early '90s as a response to Butler and the Aryan Nations. Once they were no longer an influence, the task force became considerably less active, vice president Donna Brundage says. Given how polarizing refugee resolutions in Bonner County have been — both from county commissioners and the Sandpoint City Council — there has been an increase in people getting involved with the task force. After the council withdrew the refugee resolution, the task force held a candlelight vigil in support of human rights and nondiscrimination, she says. "I think that, for a long time, the task force dropped off of people's radar because there wasn't a central need for it," Brundage says. With the way the community was divided because of the refugee issue, she says, more people have been involved with the task force because people don't want the controversy to represent the community. Rognstad admits, given the region's history, that some of the resolution's language was too inflammatory. The original wording, for example, states that responses to the issue have been "couched in racist and discriminatory terms," in addition to its reference to the KKK and Japanese internment camps. He regrets not being more careful in bringing the resolution forward and considering how it could be taken in the wrong way. Rognstad says that resistance to the resolution stemmed from fear. "It's a different thing." he says. "When you have people coming from somewhere out in the county and coming into City Hall, and imploring us not to pass this resolution because they're terrified for the safety of their children, that's a different thing than, you know, 20 years ago, when we had Richard Butler and his skinhead group south of here." The reason Rognstad likes the Granary Arts District, he says, is because it represents how Sandpoint constantly reinvents itself while still retaining its historical significance. The granary building was built in 1943 for the Cooperative Gas & Supply, a co-op formed by 60 people who each bought $10 worth of stock. It stored 25,000 bushels of bulk grain and 50 tons of sacked grain and was used by the co-op until the late '70s. The current owners acquired the granary building 17 years ago. "I think it [represents] a sense of history, belonging, something to hold on to," says granary building co-owner Steve Holt. "We want to hold on to a part of our past as a part of culture, and share it with our kids." Dann Hall, 68, is a photographer and member of Sandpoint's Historic Preservation Committee. The son of Ross Hall, a renowned Sandpoint photographer, he curates the Ross Hall Collection and Hallans Gallery. As someone who was born and raised in Sandpoint, Hall says the situations that have divided the community do not define it. But he still has a difficult time coming up with a way to describe Sandpoint.